The Barn at Stratford has been given another restorative improvement. The old rust-brown steel support posts have disappeared beneath beautiful restored Barn Posts. 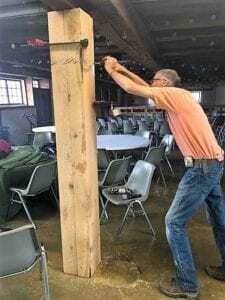 Barn Venue Manger, Connie Hoffman, has been researching, since the Barn’s opening, for ways to fully restore the look and feel of the historic 1840s stone-end bank barn. The modern steel supports simply did not fit with the style, but they were essential in providing the necessary support. Years ago many of the original wood posts were removed to provide more auction display space. Some were replaced with steel posts since each steel post can replace the support provided by several wood posts. Connie’s search revealed a company that could make a true wood post that wraps around an existing steel post. They could even make them with suitable wood so that the overall result was restorative. Connie took her findings to the Delaware County Historical Society Board of Trustees. 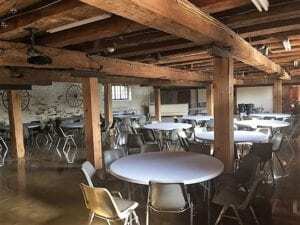 The Society owns and operates the Barn at Stratford as an event venue make this historic property available to the community and to raise funds for its maintenance and restoration. The Board considered the proposal and approved it with applause. The Society is committed to conserving and restoring this historic Delaware landmark for future generations to enjoy. The finished wood posts each had to be fitted and secured in place by hand, since each combination was unique. Mike Hoffman, yes – Connie’s Mike, took on the job with his extensive skills and experience in barn construction, renovation, and restoration. Mike matched each wrap to the best fitting post. He then shaved and trimmed the wood wrap to a perfect fit and secured the wrap in place. Mike Hoffman’s skill is visible all around the 1848 barn. 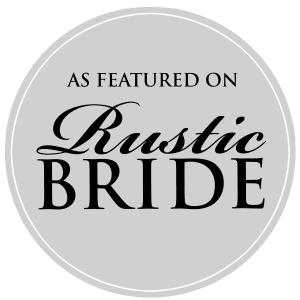 He fashioned the barn-wood fence across the Gallery’s stage, the farm table, the rolling ‘barn’ door to the Caterer’s Kitchen, and the rolling-washtub beverage icer, to name only a few of his projects in the barn. The result is beautiful wood posts are all you see supporting the Barn at Stratford Gallery. Hand-tailored much like the original beams of this historic 1848 Barn.